and a company called TrafficCast. Ten years ago a team of individuals experienced in innovative technology and real-time data analysis with a passion for traffic information and travel came together with a vision of safe roads and giving time spent on them back to the drivers. With the growth of cities and populations came the demand for advanced traffic flow data. The team strived to support the need to keep people moving by launching TrafficCast, the company behind TrafficCarma. TrafficCast delivers traffic data to some of the largest web and mobile destinations and has developed the largest data platform in the industry with the ability to track real-time traffic for over 450,000 miles of United States’ roadways. So when you’re using the TrafficCarma app, take comfort in knowing that the information is being delivered by one of the most reliable and respected providers in the business. 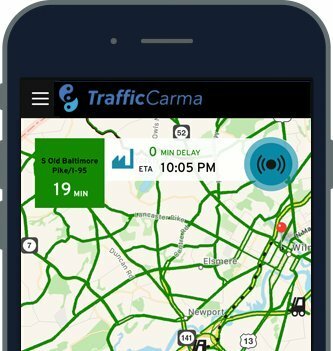 And, as part of our growing Traffic Carmunity, YOU will help power TrafficCarma…just by using the app. You can help your fellow drivers…and that’s good Carma! Want To Know More About TrafficCast? TrafficCarma is available for iPhone and Android in the Apple App Store and the Google Play store.